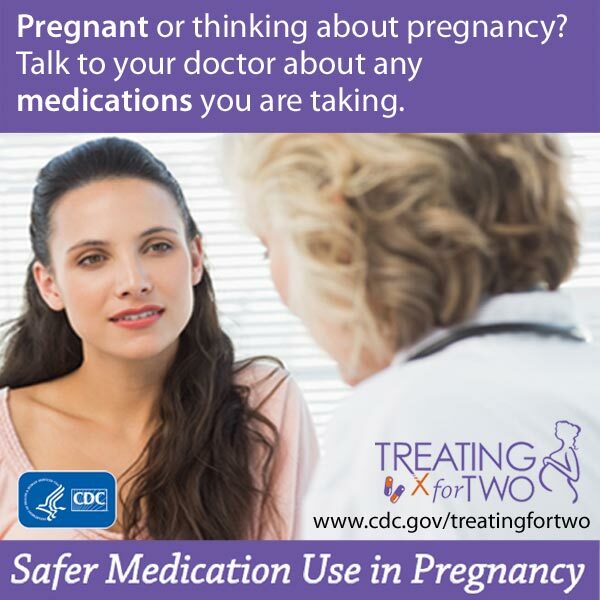 Share our poster with family and friends to encourage conversations about safer medicine use in pregnancy and help prevent birth defects and other health problems. Is it safe for me to take medicines before I get pregnant? If you are trying to have a baby or are just thinking about it, it is not too early to start getting ready for pregnancy. Many women need to take medicine to stay healthy during pregnancy. If you are planning to become pregnant, you should discuss your current medicines with a healthcare provider, such as your doctor or pharmacist. Some medicines can cause birth defects very early in pregnancy, often before you even know you are pregnant. Creating a treatment plan for your health condition before you are pregnant can help keep you and your developing baby healthy. Check out 10 ways to plan for a healthy pregnancy for more quick tips and advice. 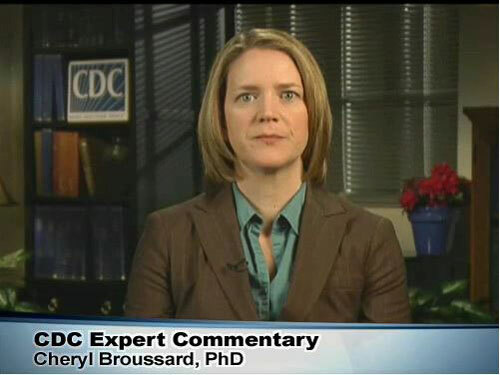 Watch Dr. Cheryl Broussard, a health scientist at CDC, talk about the effects of taking medicine during pregnancy, including birth defects, pregnancy loss, prematurity, infant death, and developmental disabilities. Medscape allows free unlimited access to materials after registration. I need to take a medicine while pregnant. What do I do? If you are pregnant, talk with a healthcare professional about any medicines you have taken or are thinking of taking. You should go over all prescriptions, over-the-counter medicines, herbal and dietary supplements, and vitamins. The FDA’s Office of Women’s Health developed a tool in English and Spanish to help you keep a record of the medicines you take. Although no medicine is completely risk-free, a healthcare professional, such as a doctor or pharmacist, can help you pick a treatment plan that works for you. You should not start any new medicines or stop a current medicine without talking to a healthcare professional. You might need to take medicines to treat a health condition. For example, if you have asthma, epilepsy, high blood pressure, or depression, you may need to take medicines to stay healthy during pregnancy. Some untreated health conditions may actually be more harmful than the medicines used to control them. However, we know that some medicines can increase the risk of birth defects, pregnancy loss, prematurity, infant death, or developmental disabilities. A healthcare professional can help you weigh the risks and benefits of each medicine and determine the safest treatment for you and your developing baby. Listen to an expert discuss why you should talk to a healthcare professional about the medicines you take during pregnancy. Check out ways you can stay healthy during pregnancy. I took a medicine before I knew I was pregnant. What do I do? If you took medicines before you learned you were pregnant, you may want to talk with a healthcare professional about any concerns you may have. Some medicines can be harmful when taken during pregnancy, but others are unlikely to cause harm. If you are concerned and cannot reach your doctor, you can contact an expert for free through email, text, call, or live chat on the MotherToBaby website. Should I trust online information about medicine safety in pregnancy? Use caution when consulting online sources about medicine safety in pregnancy– instead, use this information to start a conversation with a healthcare professional. Many websites post lists of medicines that are “safe” to take during pregnancy. However, for many medicines listed, there is not enough scientific evidence of their safety during pregnancy. Take caution when watching online videos as well. A 2015 study found that content in current YouTube videos does not accurately describe the safety of specific medicines used during pregnancy. This is an important reason for you to talk with a healthcare professional about potential risks of using medicines during pregnancy. Can I take medicine once I’m no longer pregnant? After pregnancy, keep you and your baby healthy by talking with a healthcare professional, such as a doctor or pharmacist, about the medicines you are thinking of taking. LactMed is an online database that provides information about specific medicines, ways they might affect you or your baby, and potential alternatives to consider. Information in this database can help guide the conversation with your healthcare professional about managing your health condition while breastfeeding. Check out more ways to keep you and your baby healthy after pregnancy. We know little about the effects of taking most medicines in pregnancy, because pregnant women are often not included in studies that determine the safety of new medicines. As a result, women and healthcare professionals have limited information about the safety of most medicines – especially newer medicines— in pregnancy. Treating for Two and its partners are gathering new information on medicines taken during pregnancy and how medicines might affect the pregnancy. Report suspected problems. First, tell your healthcare provider about any problems you have with your medicine. You can also report suspected problems with medicines directly to the Food and Drug Administration (FDA) MedWatch Program. Enroll in a pregnancy registry. Pregnancy registries are systems for tracking outcomes in pregnant women who take a particular medicine. After these women give birth, researchers compare the health of their babies with the babies of women who did not take the medicine. Pregnancy registries are a useful way to study the effects of a particular medicine and gather health information during pregnancy and after delivery. For a list of current pregnancy registries and how to enroll, visit the FDA Pregnancy Registry website. Sign up for a research study. Help researchers find answers about the safety of medicines during pregnancy by signing up for a MotherToBaby Pregnancy Study. If you choose to join a study, you will not be asked to take any medicines or vaccines or change any part of your routine. To see if you are eligible, visit the MotherToBaby website or call (877) 311-8972 (Toll-Free). FIT’s Chef Lizzie shows you how to feed your hungry friends healthy food they’ll love. To watch more Chef Lizzie videos and help your family become healthier eaters, visit WebMD. When your friends come over, instead of asking your mom to fix you a snack, have you ever thought about just making something yourself? You might even have fun doing it. Stick around and I’ll share some of my ideas. Ok, just give me a second! Welcome to Healthy Cooking with Chef Lizzie. When my friends come over, it’s usually not too long before we’re in the kitchen looking for something to eat. So I learned to plan ahead. Another easy way to make fruit more fun, along with cheeses too, is to use cookie cutters to make them into fun shapes. It pretty much tastes the same, but my friends always like it this way the best. Those are the quick ideas, but if you want to get a little fancier, and have a little fun, I’ve got a special recipe for something kids love. Start with whole-wheat English muffin halves and put them in a toaster. Or you can use sprouted grain muffins instead. That’s what I’m using. Once they’re toasted, it’s time for the fun. Spread about a tablespoon of marinara sauce on each half. Marinara adds some Italian flavor, and doesn’t have as much sugar as pizza sauce does. Top the marinara with turkey pepperoni for more flavor—and protein. Finish the pizzas by sprinkling mozzarella cheese on top. And now it’s time for the rest. Now ask an adult to help by putting the pizzas in the oven at 350 degrees for 5–7 minutes, or until the cheese is melted and a little brown on top. You and your friends can have lots of fun making these. In fact there’s only one thing that’s more fun—eating them. Kari Ulrich, a patient with Fibromuscular Dysplasia (FMD), shares her story of struggles before and after being diagnosed with FMD in 2007. Kari reveals details of symptoms, treatments, lifestyle changes, living her life with FMD, and resources available for patients to obtain more information about this often misdiagnosed disease. Do you know what to do if you burn yourself on a hot surface? Follow these 6 steps to soothe your skin after a minor burn. floor training in the Mayo Clinic Evacuation Disorders Program.